I am running a binary classifier at the moment. When I plot the ROC curve I get a good lift at the beginning then it changes direction and crosses the diagonal then of course back up, making the curve a tilted S like shape. What can be an interpretation/explanation to this effect? You get a nice symmetric ROC plot only when standard deviations for both outcomes are the same. If they are rather different then you may get exactly the result you describe. 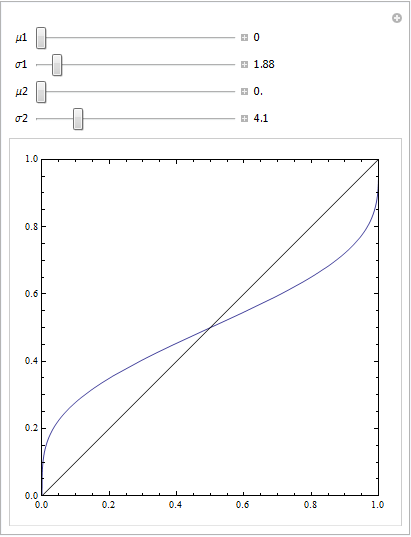 The following Mathematica code demonstrates this. We assume that a target yields a normal distribution in response space, and that noise also yields a normal distribution, but a displaced one. 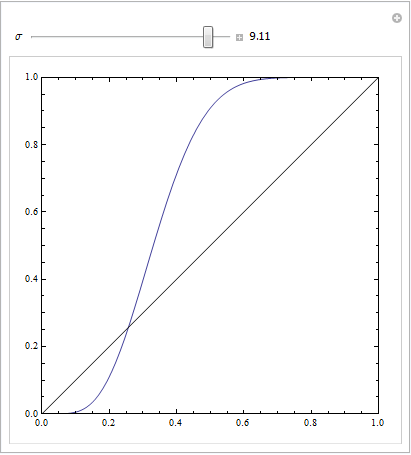 The ROC parameters are determined by the area below the Gaussian curves to the left or right of a decision criterion. 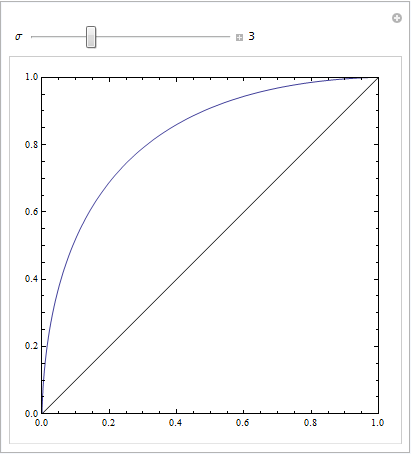 Varying this criterion describes the ROC curve. Having a string of negative instances in the part of the curve with high FPR can create this kind of a curve. 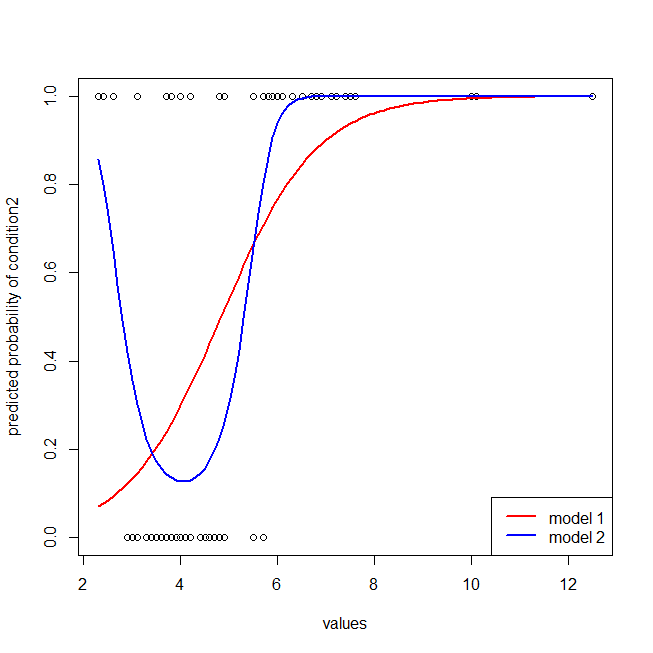 This is ok as long as you are using the right algorithm for generating the ROC curve. You can get a ROC like that if your model is misspecified. Consider the example below (coded in R), which is adapted from my answer here: How to use boxplots to find the point where values are more likely to come from different conditions? 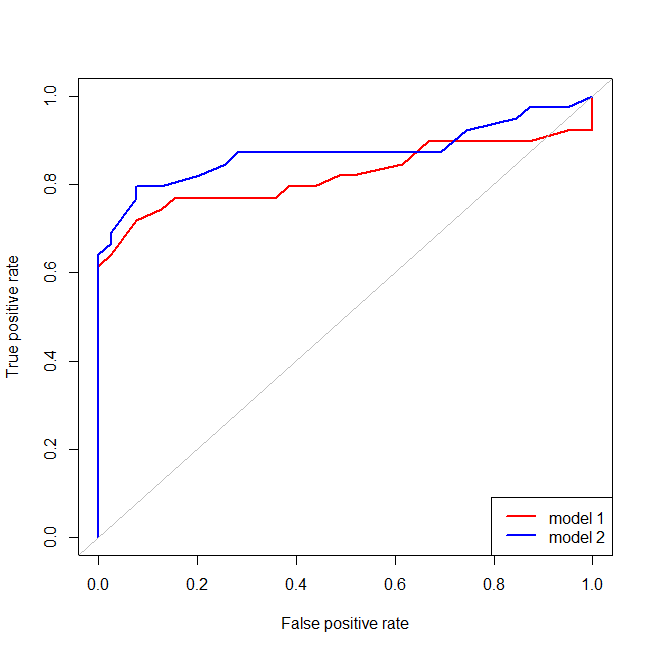 We can now see that, for the misspecified (red) model, when the false positive rate becomes greater than $80\%$, the false positive rate increases more quickly than the true positive rate. Looking at the models above, we see that that point is where the red and blue lines cross at the lower left. How to use boxplots to find the point where values are more likely to come from different conditions?